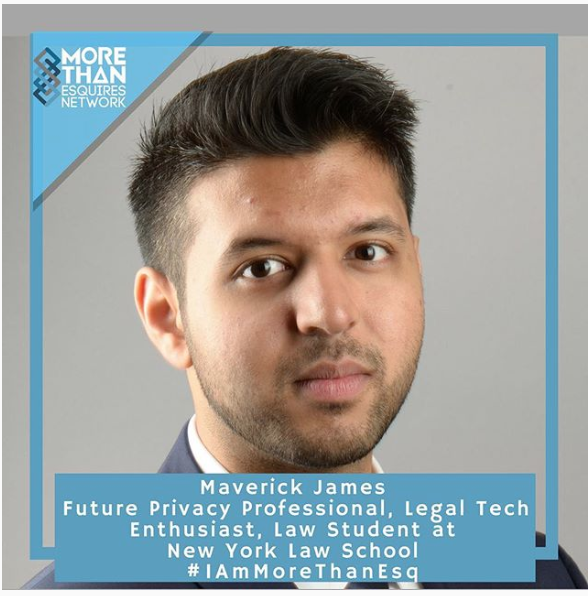 Maverick James, @MavJamesESQ, is currently a 2L @NYLawSchool focusing his education through the Innovation Center for Law and Technology on IP, privacy, emerging technology, blockchain, & cryptocurrency laws and regulations. He hopes his practice includes accountable data protection to help companies utilize Big Data that promotes innovation while also protecting consumers and private rights. Maverick is involved with Legal Tech forums and strategizes with experts on ways students can enter the profession with a background in innovative technology to augment legal practice. He is also an advocate for diversity and inclusion policies and is a member of various affinity bar associations and committees.